Horizontal Earth Boring (also known as auger boring, jack and bore, and various other names - see glossary) is a trenchless construction method performed by boring from a launch shaft to a receiving shaft. A steel encasement of the desired diameter is installed as the bore advances. A rotating cutting head is attached to helically wound auger flights which rotate to drive the cutting head and carry the excavated spoil back to the launch shaft. Process is used from as small as 6" diameter to as large as 72" diameter. Our core horizontal earth boring focus is from 18" diameter to 48" diameter. We have experience tunneling through all types of ground conditions under roadways, buildings, railways, and natural features. Generally these tunnels are a two stage or two pass operation in which the tunnel is excavated and lined with a temporary ground support system. The temporary ground support system can be steel tunnel liner plate, steel ribs with wood or steel lagging, or a wood box support system. 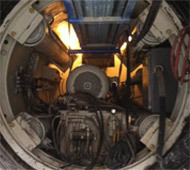 Following the construction of the tunnel the final product pipe is installed inside the tunnel, the second stage or pass of the tunneling operation. Our team has constructed tunnels for pedestrian use as well as for utility corridors for fiber optics, chilled water systems, and more. AR Daniel Construction has extensive experience in various shaft excavation techniques. We were recently contracted on an emergency basis to construct exploratory shafts adjacent to existing pump station in order to survey 48" diameter discharge pipes for leaks and repairs as needed for a municipal water treatment plant. We excavated eleven rectangular and three nine foot diameter circular shafts adjacent to the pump station for the evaluation process. Our deep experience and ability to mobilize quickly were key to the success of this project. The pipe jacking process is utilized to directly install pipes by hydraulically jacking the pipes into the excavated embankment. The excavation can be performed by hand or mechanized excavation methods. Pipe jacking can be utilized to install steel encasement pipes of larger diameters that will serve as a ground support for a final product pipeline inside the steel encasement pipe. Pipe Jacking is frequently utilized to install precast reinforced concrete pipe for storm water drainage projects. A unique offshoot of pipe jacking is jacking of precast reinforced box culverts for storm water drainage projects. AR Daniel Construction personnel have considerable experience in the jacking of box culverts. At AR Daniel Constructions services, we are committed to being good stewards to the communities and people we serve. We are also committed to making a positive impact on the world around us. When possible, AR Daniel Construction Services participates in local and international programs to help benefits the lives of those who need it most.